Greener Lives: Sofa art - good or bad design? Sofa art - good or bad design? "Sofa art" has gotten a bad rap as bland art that fills the wall above a sofa and matches the sofa's colors without doing much else. The big blank spaces above sofas do need to be filled with something, but that something should be more than a coordinating patch of color, more than another decorative item like a lamp or a pillow. We expect more than that of art. There's nothing wrong with having art coordinate with the sofa and the living room's colors and style, but that shouldn't be the main reason for selecting the art. Art that obviously was selected to match the sofa makes the room feel artificial as though was generically designed rather than created for your personal home. Whether you search out the art or an interior designer finds artworks for you to consider, select art that speaks to you personally. One of the great dangers with coordinating the color in the artwork with the sofa and other elements in the room is that you can end up with a "matchy-matchy" design where either a monochromatic room is overwhelming (or underwhelming in the case of neutrals). Get carried away with repeated patterns as well as colors, and you can come up with a design that's stifling and claustrophobic like the room below. 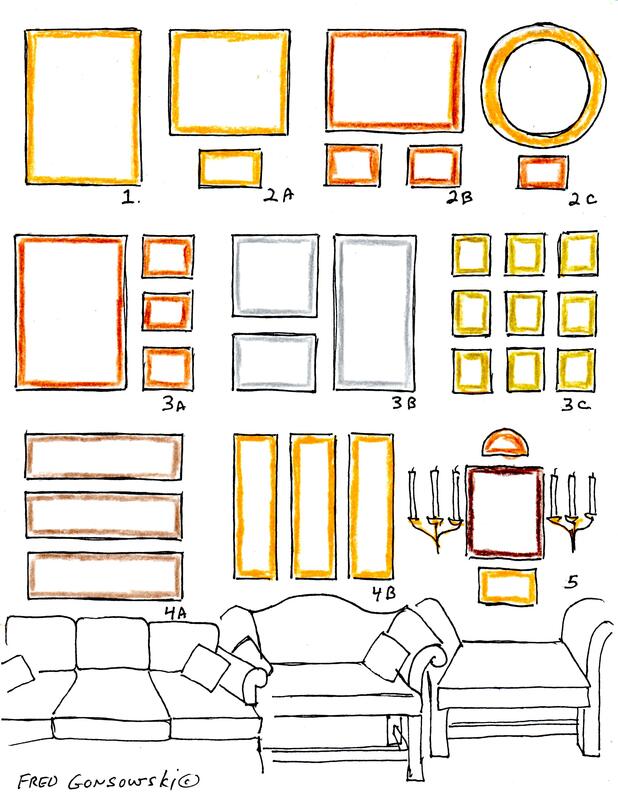 On the practical side, there are many ways to hang art above a sofa besides simply using one large painting, print or photograph. The graphic doesn't have all of the options. This room uses a dyptich design, hanging two paintings that are the same size beside each other. The dark images go wonderfully with the room's blacks and whites, but the focus is on the content of the two striking images. A good fit for the sofa sets for homes has to be first thought about, before people actually go into the shops and do their purchases. How beautifully all the feelings have been conveyed through writing.